Any treat involving lots of candy and ice cream cannot possibly be bad. My favorite thing about this easy dessert is that involves my childhood favorite, Reese's Cup. You can mix this together in just a few minutes in the morning, pop it in the freezer, and have a delicious dessert at dinner. Topped with a scandalous amount of caramel sauce of course. 1. For the crust: Preheat the oven to 350 degrees F. Mix crust ingredients together until well blended and press into an 8 or 9 inch pie pan. Then bake for 7 minutes. Remove from oven and allow to cool completely. 2. For the ice cream filling: Remove the ice cream from the freezer and allow to soften slightly. Mix in the candy and pour the ice cream mixture into the crust. Cover with foil and freeze until very hard, 1 to 2 hours. 3. For the caramel sauce: Mix the brown sugar, half-and-half, butter and salt in a saucepan over medium-low heat. Cook, while whisking gently, until thicker, 5 to 7 minutes. Add the vanilla and cook another minute to thicken further. Pour the sauce into a jar. Can be used while hot or refrigerate until cold. 4. 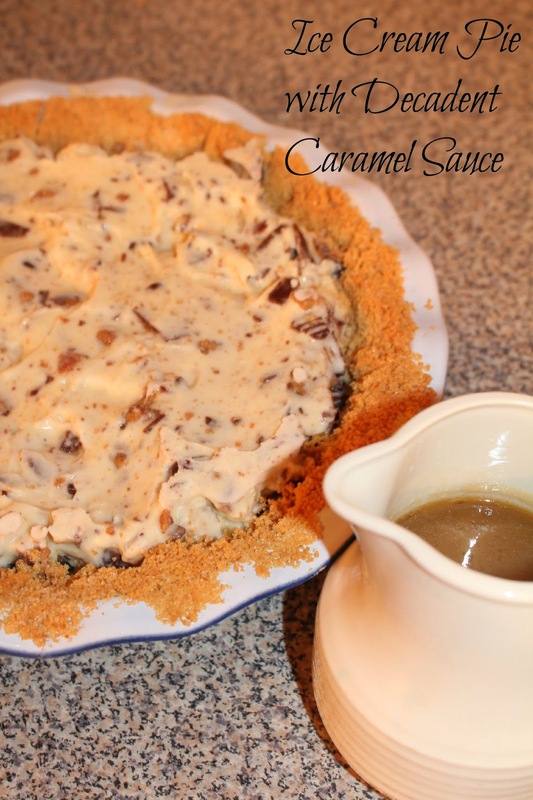 Serve slices of pie drizzled with the caramel sauce. This looks absolutely amazing!! We used to make ice cream pie in the summer when I was little. I love this version- perfect for fall and Halloween! oh my! it looks so delicious! Oh my. This looks heavenly. I have a new post, btw! It`s called "ANTIMATTER"